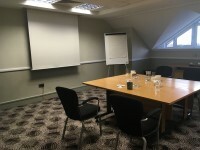 You are on Conference Facilities Introduction. Skip to the next section. 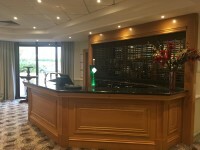 For the Holiday Inn Glasgow - East Kilbride DisabledGo access guide please click here (new tab). 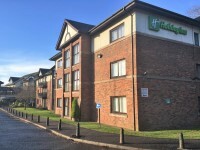 For the Holiday Inn Glasgow - East Kilbride - Leisure Facilities DisabledGo access guide please click here (new tab). The conference facilities are located on the ground and first floors. 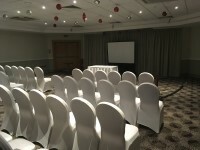 The conference facilities can be accessed from the hotel. 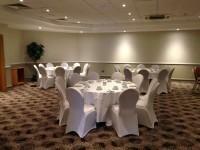 Only the ground floor Conference and Banqueting Suites can be accessed internally via the hotel. 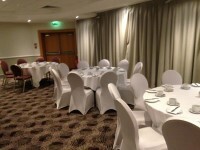 The hotel is located south of Glasgow on the outskirts of East Kilbride. It is sited off the A726 Queensway/Redwood Drive near the roundabout junction with South Road and Stewartfield Way. 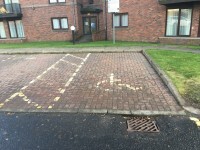 This hotel has a car park which is free for all users. Car registration numbers must be logged at the hotel reception or leisure facilities reception. There is a bus stop within 150 metres of the venue. The nearest bus stops are on South Road (southbound Slip 100m, northbound slip 240m) and Stewartfield Way (240m). For more information on First Greater Glasgow please click here (opens new tab). The nearest Railway Station is Hairmyres. 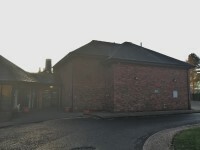 Hairmyres Station is on the Glasgow South Western Line and is approximately 1.8 miles for the hotel. There are bus and taxi routes to the hotel. For more information on National Rail please click here (opens new tab). There is not a member of staff trained in British Sign Language. British Sign Language interpreters cannot be provided on request. There is an assistance dog toilet or toileting area at the venue/near by. 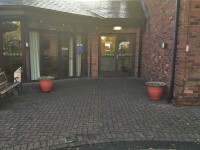 The assistance dog toilet or toileting area is located on the grass areas at the rear of the hotel. 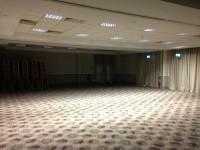 You are on Parking (Conference and Banqueting Suite). Skip to the next section. The venue does have its own parking facilities. 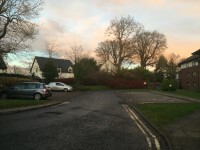 The car park is located in front of the conference suite. The maximum height of the restriction barrier is 365cm (11ft 12in). 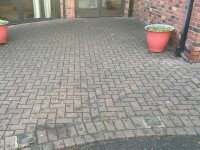 The car park surface is tarmac and block paving. 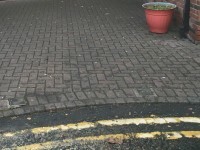 The dimensions of the designated Blue Badge parking bay(s) surveyed are 340cm x 515cm (11ft 2in x 16ft 11in). There is an overflow car park for staff and visitors. 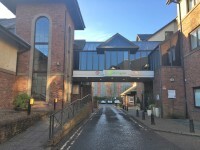 There is additional parking on three sides of the hotel and an overflow car park to the right as you enter the hotel site from the roundabout on Stewartfield Way. Assistance may be required because there is/are slopes/ramps. 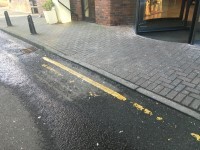 The surface on the approach to the entrance is tarmac and block paving. 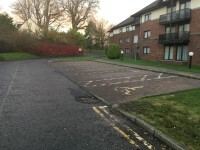 The nearest designated Blue Badge parking bay is approximately 20m (21yd 2ft) from the conference and banqueting suite entrance. Visitors must register their cars at reception for free parking. Failure to do so may end in a fine. 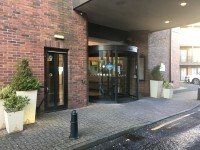 You are on Outside Access (Hotel Entrance). Skip to the next section. This information is for the entrance located at the front of the hotel. There is ramped/sloped access at this entrance. The push pad or push button is 90cm from floor level. The door(s) is/are single width. The width of the door opening is 75cm. 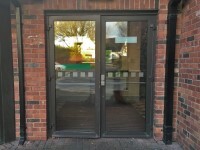 There is a revolving door to the right of the automatic door. The clear opening width is 129cm. 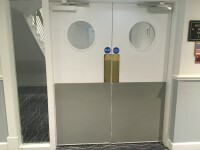 There is step-free access throughout the majority of the building. There is/are 8 clearly marked step(s), with handrails on both sides, for access to Rooms 110-136. The going of the step(s) is/are not between the recommended 30cm and 45cm. 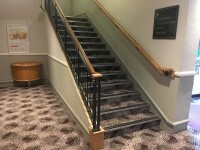 These steps are on the first floor, in the main corridor to the right as you exit the lift. The steps give access to rooms 110-136. 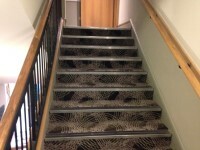 The steps are shown in photographs 3 and 4. There is/are 9 clearly marked step(s), with handrails on both sides, for access to Rooms 210-236. These steps are on the second floor, in the main corridor to the right as you exit the lift. The steps give access to rooms 210-236. 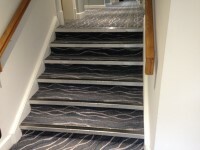 The steps are shown in photographs 5 and 6. There are doors in corridors/walkways which have to be opened manually. 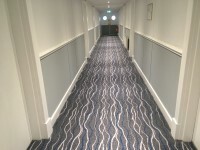 The type of flooring in corridors/walkways is carpet. 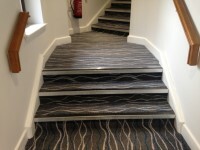 There is some flooring in corridors/walkways which includes patterns or colours which could be confusing or look like steps or holes to some people. 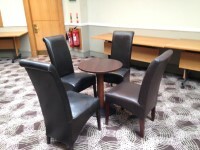 There is a mixture of seating with and without armrests at regular intervals. Access to other floors/levels is via stairs and lift. Music is played in the entrance lobby, bar and restaurant. There is not a hearing assistance system in the public areas of the building. 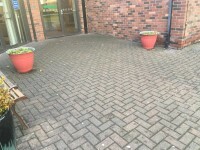 You are on Outside Access (Conference and Banqueting Suite External Entrance). Skip to the next section. This information is for the entrance located at the rear of the hotel. The width of the door opening is 156cm. The gradient of the ramp/slope is slight. 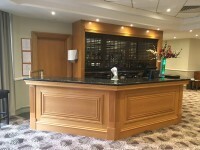 You are on Entrance (Conference and Banqueting Suite Internal Entrance). Skip to the next section. 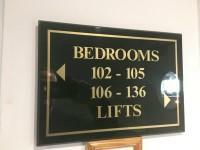 This information is for the entrance located to the rear of the hotel entrance lobby. The width of the door opening is 136cm. 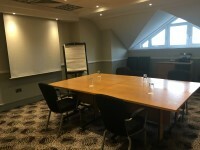 You are on Conference / Meeting Facilities (Arran Suite). Skip to the next section. 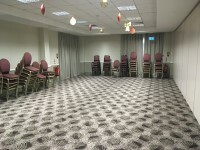 The conference/meeting facilities are located on the ground floor, to the rear of the hotel. 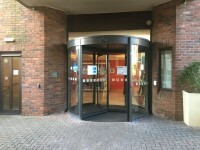 There is step-free access to the conference/meeting facilities. The door opening width(s) is/are 75cm+ for the room(s). There is not a hearing assistance system for the room(s). There are no chairs with armrests on both sides within the room(s). 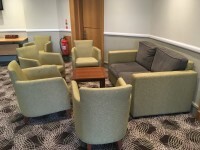 There is sufficient space for a wheelchair user to manoeuvre within the room(s). The lighting levels in the room(s) are adjustable. You are on Eating and Drinking (Arran Suite). Skip to the next section. The following information is for the bar. 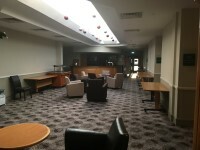 The bar is located on the ground floor in the Arran Suite, to the left as you enter the conference and banqueting suite entrance. There is step-free access to the bar. There is a/are double, heavy manual door(s) to access this area. 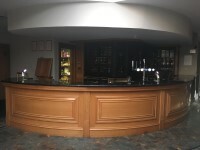 Food and/or drinks can be ordered from the service counter. The height of the service counter is medium height (77cm - 109cm). There is not a lowered section of the counter. There is step-free access within the bar. The type of flooring in this area is carpet. The nearest table is approximately 5m from the entrance/opening. The distance between the floor and the lowest table is 48cm. The distance between the floor and the highest table is 106cm. 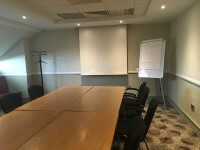 You are on Conference / Meeting Facilities (Ailsa Suite). Skip to the next section. 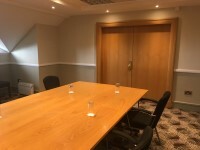 The Ailsa Suite has a large room which may be used as a single function suite or subdivided into individual or combined meeting rooms (Belleisle, Royal Troon, Barassie and Western Gailes). 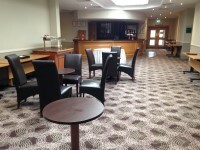 You are on Eating and Drinking (Ailsa Suite). Skip to the next section. 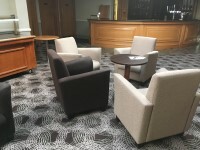 The bar is located on the ground floor in the Ailsa Suite, ahead as you enter the conference and banqueting suite entrance. The nearest table is approximately 10m from the entrance/opening. The distance between the floor and the lowest table is 55cm. 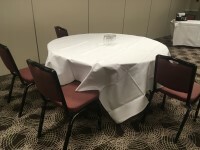 The distance between the floor and the highest table is 74cm. 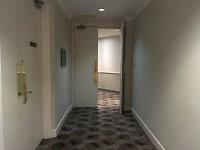 You are on Other Floors (Argyll Suite). Skip to the next section. Stairs can be used to access other floors. The stairs are for public use. 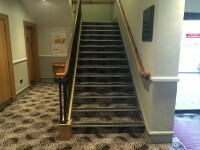 The stairs are located to the right as you enter from the conference and banqueting suite entrance. 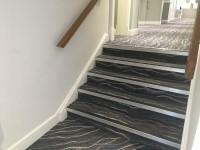 The stairs are approximately 3m from the conference and banqueting suite entrance. Signs indicating the location of the stairs are clearly visible from the entrance. 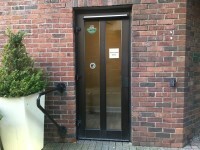 There are manual, heavy, single doors to enter the stairwell on the first floor. 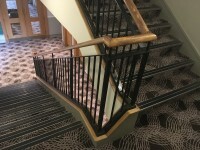 Handrails do extend horizontally beyond the first and last steps. Clear signs indicating the facilities on each floor are provided on landings. The lighting levels at the steps are good. 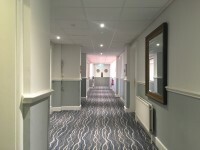 The room(s) on the floors which are not accessible is/are the Argyll suites (Machrihanish, Gigha, Machrie and Carradale). 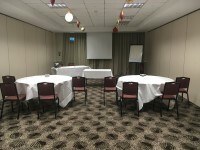 You are on Conference / Meeting Facilities (Argyll Suite). Skip to the next section. 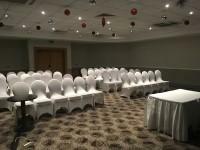 The conference/meeting facilities are located on the first floor, to the rear of the hotel, above the Ailsa Suite. 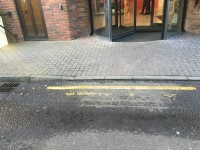 There is stepped access to the conference/meeting facilities. 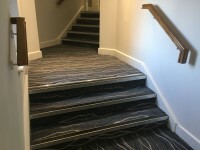 The Argyll Suite is up the stairs on the first floor and is divided into four rooms of which two may be combined to form one larger room (Carradale, Machrihanish and Gigha/Machrie). 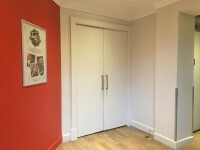 This accessible toilet is located on the ground floor, to the right as you enter the conference and banqueting suite entrance. 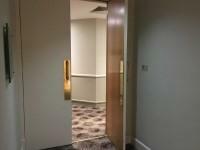 This accessible toilet is approximately 7m (7yd 1ft) from the conference and banqueting suite entrance. 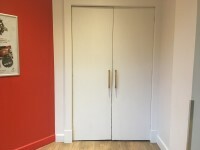 The width of the accessible toilet door is 96cm (3ft 2in). 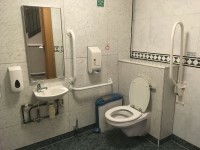 The dimensions of the accessible toilet are 159cm x 223cm (5ft 3in x 7ft 4in). The accessible toilet does have an unobstructed minimum turning space of 150cm x 150cm. The toilet has not got a non-slip floor. The lateral transfer space is 92cm (3ft). There is a/are female sanitary and waste paper pedal bin disposal units. The height of the coat hook is 100cm from the floor. The toilet has a lid. The height of the toilet seat above floor level is 42cm (1ft 5in). There is a vertical wall-mounted grab rail on the right hand side of the wash basin. The height of the soap dispenser is 86cm. The height of the towel dispenser is 126cm (4ft 2in). 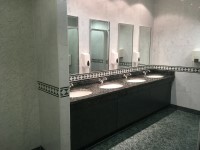 The female and male toilet facilities that were surveyed are located on the ground floor, to the right as you enter the conference and banqueting suite entrance. 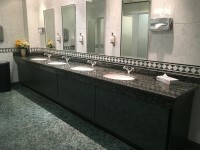 The female and male toilets are approximately 7m (7yd 1ft) from the conference and banqueting suite entrance. There is step-free access to the female and male toilet(s). The wash basin tap type is twist/turn.